Proteinuria is a result of an excess of serum proteins in the urine, which can led to renal damage. The most common cause of proteinuria is diabetes. Globally, development the arena of proteomics and nanotechnology, rising incidences of chronic and autoimmune diseases, rise in the awareness among people regarding proteinuria treatment, increasing focus on research and development process, development in drug delivery system, and advantages of protein based drugs such as, high specificity, enhanced efficacy, affinity, solubility, and low incidences of toxicity are the prime growth drivers of proteinuria treatment market. 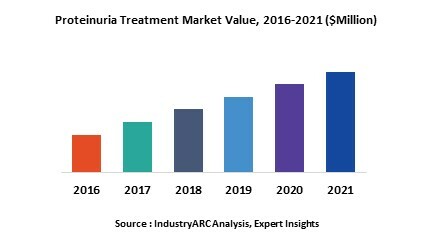 In addition, increase in adoption of proteinuria treatment in emerging economies such as China, India and others, will create new opportunities for proteinuria treatment market. However, higher cost of the research and development, and complex government approval processes are the key restraints for proteinuria treatment market. Geographically North America dominated proteinuria treatment market, with approximately half of the market in the U.S. because of high medical reimbursement facilities, and technological advancement. Asia Pacific is projected to have fastest growth, owing to rapidly increasing population, rise in consumer awareness, favourable government policies, modernization of healthcare infrastructure, and growing population chronic and autoimmune diseases patient in developing nations such as China, and India in this region. Among all the types, antibody segment has the highest market share in proteinuria treatment market due to higher prevalence of cancer patients.